fetisov « Japan, Hockey, Baseball, etc. Q: Your article last weekend portrayed a K.H.L. that seems to be on the rise. Has there been reaction from N.H.L. types, who generally have tended to play down the Russian league’s viability? ANDREW MEIER: To judge from reaction I’ve heard, N.H.L. officials are intrigued. Certainly if you ask anyone on the Rangers, who learned firsthand in their preseason game against Magnitogorsk, few doubt the level of play in the new league. And Magnitka, as your readers know, ain’t even close to the top of the K.H.L. I would not be surprised to see the N.H.L. moving eastward, as the Russians move westward — and we get N.H.L. season openers one day soon in Russia. Q: The world financial crisis of the last few weeks has hit Russia hard, particularly affecting industries like oil, steelmaking and mining. Since several teams in the K.H.L. are owned or sponsored by such industries, will they have to drastically cut expenses? Will we see a fire sale of players, for example? A.M.: Couple of things we have to remember when trying to gauge how hard the global financial crisis will hit Russian sports. First of all, Russia’s stock market began to plummet much earlier — back in May. It then sank in most dramatic fashion in the aftermath of Russia’s invasion of Georgia in August. It’s down, way down, but still alive. (When trading gets too wild, they shut it down for the day.) Second: the Russian state has been saving up for this rainy day. The state oil reserve fund has at least $141 billion. Third: Putin and Medvedev have moved quickly to shore up the favored oligarchs, offering liquidity lifelines to a host of industrial and financial titans. Finally, even though Russia lives on oil and gas exports and the oil price has fallen in recent weeks, it’s still higher than the price pegged (roughly $70/barrel) in the state budget. Tuesday was a special day in the K.H.L. Vyacheslav Fetisov, already the Russian Minister of Sport and as of last week a senator in the upper house of the federal legislature, was elected chairman of the league board of governors. The 50-year-old ex-CSKA, U.S.S.R., Devils and Red Wings star promptlytold the K.H.L. Web site, “We should develop in the direction of the Far East, and make the league not only European but also Asian.” He said there was interest in joining the K.H.L. from businessmen in Japan, South Korea and China. Given the 50 percent drop over the last three months in the price of oil — the basis of the Russian economy and of the Gazprom-funded league’s wealth — K.H.L. expansion into other countries seems more and more like a pie-in-the-sky proposition. Falling oil prices and a domestic financial sector hard hit by the current credit crisis have already forced the Russian government to rethink budget and foreign policy initiatives, as the Times’Clifford J. Levy reports. Given such circumstances, does Fetisov really believe that the Continental Hockey League will soon be icing teams in Seoul and Beijing? He’s said this before, so I guess Slava’s really got KHL’s eyes on Asia, but chances are slim to nil for many reasons, including the ones in the blog post, but if the KHL is interested in Asia, they’re (or is it just he, as in Fetisov) more likely interested in absorbing the Asia League with existing franchises and fanbase (however small) rather than creating new franchises in the Far East. Then again with the level of play in the Asia League, the teams would get slaughtered in the KHL without heavy reinforcements, and that wouldn’t work out well in terms of fostering home grown talent and interest in the game. 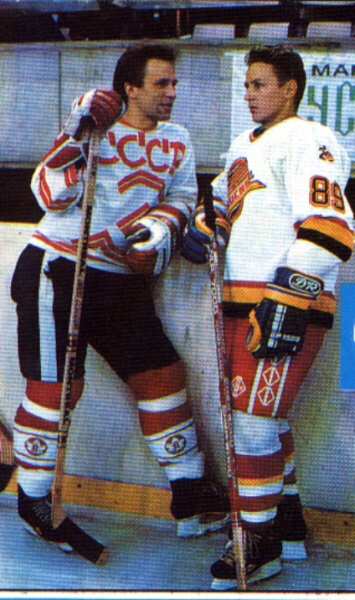 Here’s a fun old time Fetisov and Larionov photo for kicks.